Since 1933, volunteers in the Eagle River area have been getting together around this time of the year to build an ice castle. How did this tradition start, though? Gary Entz has the story as part of our weekly series A Northwoods Moment in History. On the weekend nearest to the New Year, volunteers in Eagle River gather on Silver Lake to score and cut over 2,300 blocks of ice. Each block is 12” x 10” x 20” in size and weighs roughly 60 to 70 pounds each. 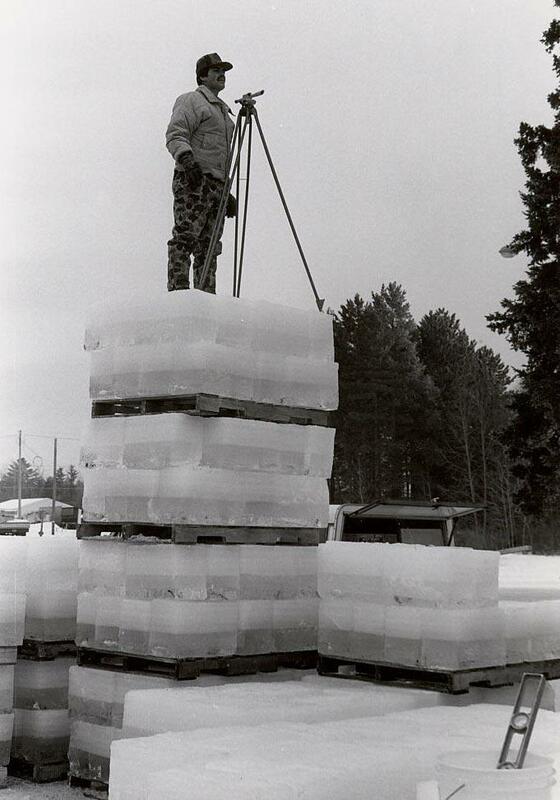 These blocks are subsequently hauled to Railroad Street in Eagle River where volunteers stack them into place in order to construct a glistening palace of ice. The Eagle River Ice Castle is an annual Northwoods tradition, but how did this unusual practice get started? The first Ice Palace was constructed in Eagle River in December 1933. In that year, Edward Bandow, with help from William Radue, gathered a number of volunteers to cut 400 blocks of ice out of Silver Lake. The blocks were hauled to the corner of Wall and Railroad Streets where the men stacked them into a palace decorated with colored lights. The castle was situated so it could be seen coming into the town from any direction. Townsfolk boasted at the time that Eagle River had put on its absolute best Christmas garb. Bandow did not build another ice palace, but the people of Eagle River enjoyed what he had done. 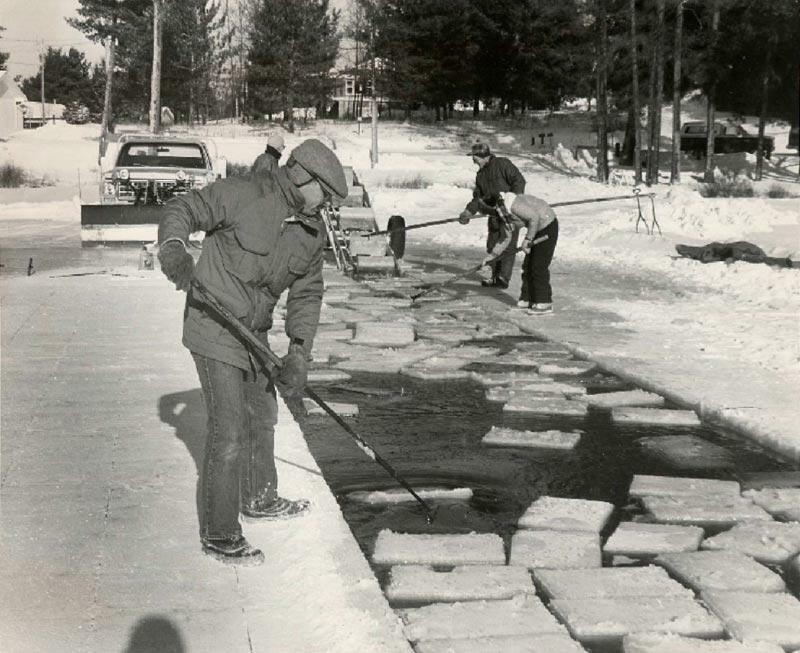 Therefore, on January 2, 1935, volunteers from the town again went out to Silver Lake to cut blocks of ice. Unlike the first castle, however, this smaller palace was built for New Year’s rather than Christmas. Louis Behlow took charge after that. A smaller castle of 250 blocks of ice was built in the winter of 1935-36, but the tradition was started as this was the first one used for more than just decoration. On Sunday, January 19, 1936, Eagle River hosted an afternoon of mystery at the Ice Castle featuring magic performances by magicians from Wisconsin and neighboring states. With a holiday tradition firmly in place, the residents of Eagle River in December 1936 built an Ice Palace twice as large as the one from the previous winter. However, unseasonably warm weather struck shortly after the palace was constructed. On January 2, 1937, the residents of Eagle River were awoken from their beds by the sound of a giant bang followed by a “whooshing” sound. Everyone was dismayed to see that the Ice Palace had collapsed. Undaunted, as soon as the weather turned cold again, volunteers in Eagle River cut new blocks and rebuilt the castle. Therefore, the winter season of 1936-1937 was the year Eagle River had two Ice Palaces. Fortunately for the hard-working volunteers, two a year did not become a tradition. This story was written by Gary Entz and produced for radio and the web by Mackenzie Martin. Some music for this commentary came Podington Bear. The photos used above are from the Eagle River Chamber of Commerce and can be found here. This week on A Northwoods Moment in History, local historian Gary Entz takes us back to a rather curious bank robbery that took place in Antigo in 1888. When we hear stories of bank robberies many people automatically think about tales of the Old West or perhaps the gangsters of the 1930s. However, bank robberies happened in other times and other places as well, and one curious Northwoods bank robbery took place in Antigo during the year 1888.